The Machine and the Real Estate Agent – Notorious R.O.B. I’m taking a break from writing my February report, and thought I’d think through something with you all. It’s not directly relevant to my Red Dot topic, but it’s so interesting that I couldn’t help but want to do some “read what I wrote to see what I think” type of a thing. We all know that one of the hottest “big picture threat” type of things out there is AI and machine learning. I know pundits, including myself, have wondered out loud about sophisticated computers replacing real estate agents — the image above is from a presentation I’ve been giving for a few years now. But I ran across a couple of things that make me wonder even more about what might be coming down the pike. So let’s get into it. In my research for the February Red Dot, I came across the invaluable Zillow Consumer Housing Trends Report for 2018. I think it’s one of the more valuable things that Zillow produces, and it’s entirely free and entirely online. Go check it out. Agents play an integral role for nearly all consumer households throughout many stages of the home-buying process. For many buyers, agents are strategic partners who help with many aspects of the process and take charge of others. About three-quarters of buyers have agents lead contract negotiations and guide them through the overall process (74 percent), take them on private tours (73 percent), and organize and submit paperwork associated with buying a home (71 percent). Buyers take a more active role in other activities saying they participate, often with agent partners, to identify new homes for consideration (35 percent), preview and screen homes (32 percent), and find a mortgage broker by referral (32 percent). There is no part of the process where buyers fly solo, but buyers appear to require less help on some things than on others. For instance, 42 percent of buyers say they did not rely on agents to determine whether a home is right for them, a recognition perhaps that how a home makes them feel is as important as the rest of the calculus. The overwhelming majority of buyers recognize the value of agents and appear to see them as an essential part of the complex buying process. Overall, most services performed by agents are highly valued by buyers who work with an agent to buy their home. Pretty cool, eh? Hold on to that thought for a moment. In my research, I came across Erik Brynjolfsson, an economist at MIT and co-author of the book The Second Machine Age among others. He is an expert on AI and machine learning and automation. You’ve touched on this, but as far as potential drawbacks of this huge boost in mental power, what are the biggest ones? We’re having a big disruption in the kinds of skills and jobs and occupations that are needed in the new economy going forward. Routine information-processing tasks are especially easy to automate. Consider what a tax preparer does. There are 17 percent fewer tax preparers now than there were a few years ago — not because taxes are so much easier to do, but in large part because software like TurboTax let’s a machine do most of those steps. And so there’s two groups that really benefit, and one group that doesn’t benefit. One group that benefits is consumers, who can get low-cost or even free digital goods — that’s good news. Another group that benefits are the people that create these innovations — they create a lot of value, and many of them become millionaires and even billionaires. But there are also the people who used to do those jobs, and they used to do them without the same amount of technology. And they’re not adding as much value as they used to, because a piece of software can do much of those tasks. So that hasn’t worked out well for them. Now to be clear, technology has always been destroying jobs, and it’s always been creating jobs. When the car was introduced, people who made horse shoes and buggy whips, a lot of them lost their jobs. But what’s happening now seems to be affecting a lot more occupations and jobs, and a lot more skill categories than in the past. And it’s a little harder to see what the new ones are going to be. I hope we’ll be able to develop them, but they’re not as visible right now as we’d like … Data suggests that in the past 10 to 15 years (jobs) have been automated faster than we’re seeing the creation of them. So what’s your conclusion about where we’re headed? Robotics has already replaced a lot of manufacturing jobs and manual labor jobs. Take a look at any modern car factory if you need evidence. But the latest technology is replacing service jobs. If you haven’t seen one of these self-service kiosks at fast food restaurants, just wait a bit. I’ve been seeing more and more of them lately, especially at places like airports. Those are mere order-takers, of course, and it was obvious from the moment that ecommerce became a real thing that cashiers at fast food places were going to be replaced. But white collar professionals (which includes real estate agents) are as yet unaffected by such automation. AI can analyze sales calls far faster than any sales manager could — in fact, it would take 9 years of nonstop sales call analysis for a human being to compete, and that’s if they didn’t take vacation or sleep. And AI is already being used to develop marketers’ content strategies and email marketing playbooks — it’s only a matter of time before it plays a bigger role in the process. HubSpot co-founder and CTO Dharmesh Shah has a more positive outlook on the future of AI — in fact, he thinks bots and AI will make us better at our jobsand more secure in our careers, not the other way around. So let’s say that real estate agents are not going to be replaced. Rather, AI will serve to make their jobs easier and make them more effective and data-driven. That’s kind of the vision that Alex Rampell touched on in his When Software Eats the Real (Estate) World video that has generated some buzz in the industry. So far, so good, and so far so meh… because we’ve all been having these high-level generic discussions over the past couple of years. Here’s my new question: Look at the list of the value of services provided by a real estate agent, according to Zillow’s consumer study. Which of these are not subject to being replaced by a machine? Let’s go through the list, real quickly, and see if it falls under “routine information processing” or “sales and marketing analysis” type of tasks. Organizing and submitting the paperwork associated with purchasing the home (87%): Uh-oh. Leading private home tours (84%): Uh-oh, because August Lock is a thing. Leading contract negotiations (84%): Seems safe. Guiding through overall buying process (83%): Not sure what this encompasses, but… wouldn’t an FAQ do just as well? Or a software wizard like you find on TurboTax? I’ll go with Uh-oh unless this means more than what it seems. Providing guidance on legal terminology/requirements (79%): Same as the “guiding through overall process” thing… seems like a wizard can do this just as well? Uh-oh, for now. Helping decide details of offer(s) (78%): Seeing as how Redfin has already developed technology using big data and machine learning to do just this… I’m gonna go with Uh-oh. Providing access to homes that are not (yet) publicly listed or on the MLS (75%): What the…??? Pocket listings would be a value, of course, but you don’t need an agent for that — a website will do just fine, as we all know. So Uh-oh on this one. Referring to a mortgage lender (75%): Uh-oh, for sure. This can be done today with a webpage. Referring to an inspector (75%): Uh-oh, same as lender. Identifying new homes to consider (73%): I’m not sure… on the one hand, the agent knows the buyer… on the other hand, so does Amazon and Google, especially if the buyer has an Alexa listening to his every word…. I’m going with Uh-oh for now. Previewing and/or screening homes (71%): Seems safe? Maybe? Helping decide if a home is the right one (68%): Seems safe. Referring to a contractor for home improvements (67%): Uh-oh, cuz, anything referring can be done today. That’s my take on the list of services consumers say they value. You should look through that list yourself and see what you think. Just about everything else falls into the “routine information processing” bucket of Brynjolfsson, or even a step below that, as in a website or a mobile app can do it better, such as referring contractors. We know because there already are websites and mobile apps that do just that, such as Angie’s List. One of the more interesting things to happen last year was the distinction that Gary Keller drew between “tech-enabled agent” and the “agent-enabled tech.” Thinking about this AI situation, perhaps the right question isn’t which of those is going to dominate the industry going forward, but what the value of the agent is versus the value of the technology. It isn’t “tech-enabled agent” vs. “agent-enabled tech” but “technology and the agent” that together deliver services to the consumer. But who/what delivers which service to the consumer? Who/what is better at which service? Another way to ask that question, perhaps, is this: If you remove routine information processing tasks from the real estate agent, what service is left to deliver that is of value to consumers? It’s an important question to answer, for the agents in the field, for the brokers who train and manage them, for corporate CEO’s who make a living because of agents and because of technology, and for the MLS and Associations that serve agents. It might not be tomorrow or the next day, but that question is coming to real estate and when it arrives, we had better have some answers. First-time commenter, been reading a few months. I guess I’m not as “uh-oh” about tech/AI as you are overall. I would grade some of those items differently. Like with #4, can a web page explain and guide someone through the buying process? Sure, most real estate websites have a page that lists the 8 or 10 steps to buy a home. But the web page can’t account for the myriad directions that any buying transaction might go, and I’m not sure a software wizard could cover all the bases on a state-to-state basis. Certainly some of what an agent provides will and should shift to being provided by machine. My wife’s the agent in our family and there’s a good amount of stuff she does that I wouldn’t mind seeing automated. But I think in the end, more people than not are going to want human expertise helping them with the biggest purchase they’ll ever make. So when I look through that list, I still see plenty of opportunity for good agents to provide value — side-by-side with tech, but not replaced by it. Great thought piece, Rob. Thanks for putting your thoughts down. sure, the process to refer resources to buyers and sellers can be automated. But should they? For all the ways you can find stuff online, getting a good referral is still either by reviews( as long as they are true) or word of mouth. A slick marketing page shouldn’t take the place of a trusted adviser (don’t let me be a debbie downer on marketing, I have a background and love it) How do you determine ethical behavior from a webpage? I just binged-watched the two documentaries made about the Fyre Festival, which both were warnings to trust in marketing alone. Caveat emptor, anyone? All the most valuable services on the graphic with the exception of “leading private home tours” can be summed up as “RE agent takes the fear/worry out of buying/selling a home.” One could argue even #2 is an aspect of fear/worry, since most buyers would be uncomfortable walking into a stranger’s still-occupied home. I’m not a Luddite. I have no doubt that over time software/AI will at least partially automate many of the tasks on the list. But I still believe the majority of consumers are not emotionally ready to enter into a life-changing buy/sell transaction after pushing some buttons on a website – no matter how much they read online. To alleviate fear/worry, people need to trust first, and trust is built on personal relationships. Crack that nut, and you’ve got a disruptive solution. This doesn’t have to be scary, especially if the technology is diffuse. Independent brokerage XYZ Realty might be able to keep up making use of all these same tools and data through third parties, too. There will be consolidation, but I think many of the serious forward thinking brokerages and agents will keep in the game. And then think past the sales process and consider how much more of the process that is often neglected, even by bigger brands. Content creation. event planning, community outreach, … while AI is displacing *sales agents*, there are other real estate roles waiting to blossom that aren’t yet as easily automated. Real estate was, is and always will be people business based on relationships and trust is the strength of that bridge.Will the average home buyer put a trust on an AI as a decision maker, should he needs to pay $2 m to buy a home? I really don`t think so. Agreed, but there’s a deeper point here. If a majority of tasks are automated, and the “valuable” things agents used to providing for a fee are done by a machine, the commissions agents earn will decline (just like those in the financial advisory industry). When that happens, underperforming agents exit the market. So it’s not a direct “AI comes, agents leave” relationship, but one that instead starts with taking away certain pieces, putting pressure on earnings, and ultimately driving out players. The agents that stay will be those that create niches, have large networks, are better advisors, etc. The average consumer will trust the agent over an AI, all day long.To whom would you complain should the AI made an error that cost you money? The AI can not fix itself it is always a human who controls it. I 100% think consumers will ultimately trust AI MORE than humans. Why would you do otherwise? You know an AI has machine learning and is far more dispassionate and thorough at analyzing data than a human can be. Humans have “opinions”. Machines only deal with facts, or at least, that is how consumers will see it. Look at how we already trust robots over humans. I specifically go to Wal Mart instead of HEB sometimes because I can do the self-checkout and not have to make eye contact or chit chat with a cashier. Maybe I’m just an anti-social jerk, but I see few trends that suggest humans will much miss the “human touch” or are ultimately untrusting of machines over humans. The right question: … what service is left to deliver that is of value to consumers? In other words – in a tech enabled, routine task automated world – how do we truly add value to our clients? So first we need to clearly identify who our client is? Obviously it’s the person who engages us, who pays for our service. Which in real estate is the seller. Right? this situation where the sellers are paying for the buyers representation & agent services. Which in itself is rather odd. It’s like paying for somebody else’s lawyer to sue you. And as you point out Rob, many of those perceived ‘value adds’ to the buyers are questionable moving forward. Imagine for a moment that buyers had to directly pay for those buyer agent services. Would they be prepared to pay for services they no longer need? Or would they only be prepared to pay for the real value – say negotiations & professional advice etc? And would they be prepared to pay say 3% of the value of the property they buy, for such services? Of course ‘buyers’ in North American will keep using agents for all of those things as long as it continues to be (in their minds) FREE. After all, the sellers are paying for those services that the buyers no longer really need. I can’t help but wonder how much longer Sellers in North America will be prepared to keep paying for those needless buyers services? Prediction: Buyer Agent Services (as North Americans know it) days are numbered. Which will almost instantly halve the number of agents needed in the market. So I believe the right question we need to be asking ourselves as an industry is: How do we add value to our sellers in this new world? And even here times have most definitely changed. Like with buyer agents – our role and value proposition has shifted from “Salesperson” to “Professional Service Provider”. Our value is in the quality of our advice, strategies, smart marketing, and skilled negotiations. I propose our job is to help our client end up with the most possible in their hand from the sale of their property. In other words – leave them better off than they would have been without us. Firstly helping them avoid fundamental & costly mistakes. This comes down to our knowledge and professional advice to protect their interests. Secondly, using proven processes and systems to maximise our clients sale price. This is much more than just marketing. Helping with pre-market prep & presentation, the right approach to market / method of sale, carefully protecting our clients interests and properties value, skilled negotiations and troubleshooting. These first two require hyper local knowledge. And because each individual client, individual property & Individual market are unique – it’s very difficult to ‘automate’. Meanining surely this is where we must focus? Finally, step 3 is helping to minimise our clients selling costs. Which is about finding ways to remove bloat, inefficiencies and wastage… ways to reduce our clients outgoing costs while at the same time keeping the highest professional standards. This last area is where the real estate industry (IMHO) is sorely lacking. It can’t see past ‘the way it’s always been done’ (% based contingent commissions) – which is a massively inefficient and bloated model… Where the genuine sellers commissions effectively subsidise all the time, effort & outgoing costs the industry loses working for ‘non-sellers’ (and non-buyers for that matter). We’ve found that by shifting to a “professional service” mindset and fee structure (ie. charging clients non-contingent fees based on the actual work & outgoing costs needed on each clients behalf) that we can significantly reduce their selling costs – while we as agents are earning about the same. It’s a win win. And becoming increasingly harder for traditional agents in our market to compete – let alone justify their traditional commissions. Of course the majority of our industry suffers from the ‘deaf effect’ – a reluctance to hear, acknowledge or confront the truth – especially when that truth is bad news for the status quo. So dismiss any talk of lowering commissions, or AI changing our value proposition etc … and continue to keep doing what we’ve always done. Until one day we find ourselves obsolete. Great stuff. Just wanted to point out that Zillow has a whole section for sellers; I just didn’t write that up because I found the buyer section interesting on its own. Perhaps a look-see into the seller services is worthwhile as well. I really thought Amazon was going to take over the world and consumers would be buying real estate with the click of a mouse by now. wow, was I wrong. What happened to the drones that were going to be delivering Amazon prime packages to our doorsteps? I suspect with Bezos’ divorce Amazon real estate will be put on the back burner for the next several years. The promise of AI seems to me to be grander than the result. Flashback: remember Roomba and was projected it was going to change households across America? I give Gary Keller credit for KW’s motto, when I was there was, “under promise, and over deliver.” That motto has served me well and the reason why I have loyal clients coming back to hire me for their real estate needs. Selling is not hyperbole, or what we might call in real estate jargon, puffery. It is meeting consumers’ needs. Self-check out is nice when you have a couple of items and need to get out in a hurry. Other times we can’t get out as easily and need some extra assistance. 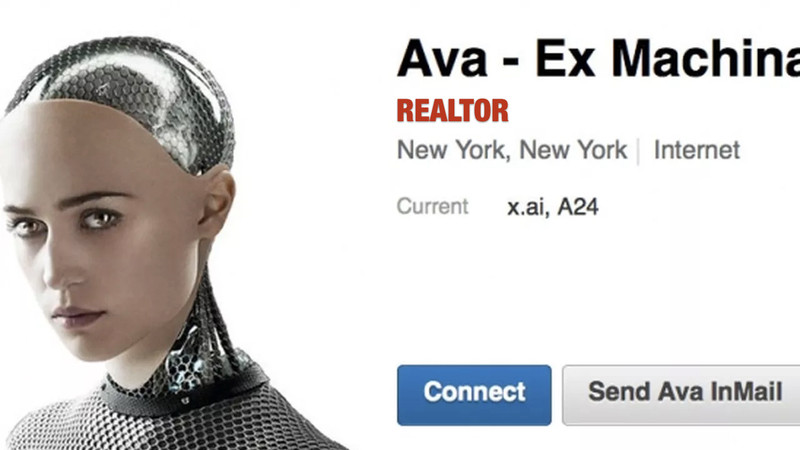 That’s how I view AI in real estate. It might serve some people at some time, but not all the people all of the time.